At Calvary John James Hospital we offer a high standard of patient care to the communities of Canberra and surrounds, as well as a comprehensive range of health services. Learn more about services below. The Intensive Care Unit (ICU), provides special care and monitoring for patients with medical and surgical conditions that require specialist critical care treatment. Our state-of-the-art intensive care facility is supported 24/7 by specialists offering a high level of medical care for critically ill patients, and is staffed by specialist. Our birthing suites are designed with an emphasis on comfort, and offer you a relaxing, safe, comfortable environment in which to have your baby. We also actively encourage your partner and/or support person to be involved in your care throughout labour, birth and beyond. At Calvary John James Hospital our aim is to provide an environment of clinical excellence in the field of medical nursing. Our focus is to provide a holistic, multidisciplinary approach to patient assessment, care planning and discharge planning to ensure that our patients receive care of the highest standard in a timely, effective manner. This approach also ensures a successful transition for our patients from hospital to home or Aged Care Facility. Our patients will receive care from a team of nurses and Allied Health staff who are committed to ensuring an environment conducive to healing in a slow-stream specialty designed predominately for aged patients, with focus on patient care and safety. We also provide a compassionate and supportive environment for patients and their families who come to us during their end of life phase. Our aim is to be flexible and accommodating with special attention to pain management, comfort measures, maintenance of dignity and respect for the individual. At Calvary John James Hospital, our aim is to provide an environment of clinical excellence in the field of Orthopaedics. The Calvary John James Hospital Pre-admission Clinic is a free-of-charge service, which provides patients with information and support. Our goal is to better understand your needs and ensure you have a positive stay with us. Provide patients with the opportunity to discuss their expectations for their hospital stay and answer any questions they may have. Calvary John James Hospital undertakes planned (elective) and unplanned (emergency) surgical procedures. At Calvary John James Hospital our Dietitian will work with patients to create an individual treatment plan based on individual nutritional needs. Our Dietitian prescribes therapeutic diets for different medical conditions, provides counselling and dietary education to patients and their families, and liaises with the kitchen regarding specific dietary requirements of patients. If you have a planned admission to Calvary John James Hospital you will have the opportunity to describe your disability and appropriate arrangements can be included in your admission process. At Calvary John James Hospital, our aim is to improve and increase the strength and balance of the de-conditioned individual using a multi-disciplinary team approach. The Falls Prevention team at Calvary John James Hospital believes that a combination of physical activity, education and healthy eating will greatly improve the body’s ability to cope with the stresses of day-to-day living. Our program is delivered over 10 weeks and participants attend 2 sessions per week (a total of 20 sessions). Each session takes 2 ½ hours. This will allow time for the gymnasium and the hydrotherapy pool. Improve your strength, balance and fitness with our 1 hour exercise classes, run by our accredited Exercise Physiologist. Our Catering staff take great pride in the quality and presentation of all meals prepared daily. The menu has been nutritionally analysed and uses only the freshest of ingredients. Calvary John James Hospital’s kitchen takes food safety very seriously and follows the HACCP food safety standards. Our Occupational Therapists are focused on helping you maintain your independence, mobility and safety. We will look at your home and work with you and your family to find the right equipment and suggest minor modifications to make life easier. We also look at lifestyle tasks and can suggest ways of making it easier or more efficient to re-engage in these tasks. Occupational Therapists can also organise for minor work to be completed and can give you access to any necessary equipment. At Calvary John James Hospital we offer compassionate emotional support and spiritual care for you, your family and friends. Our Pastoral Care Service acknowledges your beliefs, important relationships and all that is meaningful for you. It affirms your intrinsic value as a person. If you would like a visit from Pastoral Care please ask a staff member. Pastoral Care is provided to all patients as part of their holistic health care. Calvary John James Hospital has an onsite pharmacy servicing hospital patients only. Provided by Epic Pharmacy, the service ensures hospital patients are provided with medications required during their stay and on discharge. Please note, Epic Pharmacy cannot fill scripts or provide medication to any member of the public or visitors to the hospital. Please note: It is important that patients bring their current medications and prescriptions when they are admitted to hospital. Physiotherapists assess and develop programs to improve a patient’s strength, mobility, movement and function. Our team offers advice on personal mobility and safety in both individual and group sessions. When you visit Calvary John James Hospital you will first be assessed by our Speech Pathologists if you have identified issues in any of the above areas. An individual treatment plan will then be created with you and your Speech Pathologist. Education and support is provided to you and your family members throughout the treatment process. At Calvary John James Hospital we offer the following range of diagnostic services. Endoscopy is a general term covering any procedure that involves examining the interior of the body with an endoscope. Calvary John James Hospital has a specialist team that uses cutting-edge technology to carry out all endoscopic treatments. Endoscopy is carried out under anaesthesia, which means you will not be able to drive home after your procedure. You will receive instructions from your GP about preparing for your endoscopy. Please follow them carefully. At Calvary John James Hospital we have an on-site pathology department, managed by Capital Pathology Canberra. Capital Pathology offers a 24 hour laboratory service that delivers expert analysis, testing and advice to our team of health care professionals. We offer a comprehensive range of routine, specialty and emergency pathology testing, with a fast turnaround for results. 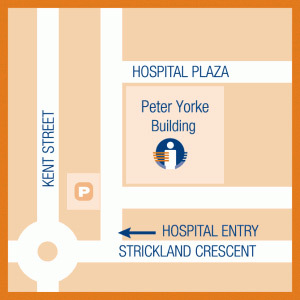 At Calvary John James Hospital Campus we have a Radiology department, managed by Canberra Imaging Group who are located on level one in the Peter Yorke Building within the Calvary John James Hospital Campus.